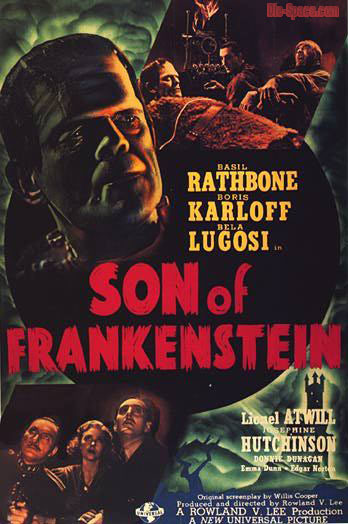 Synopsis: Wolf von Frankenstein (Basil Rathbone) travels from America with his wife and young son to take possession of his late father's estate. He is met at the train station by the citizens of Frankenstein village, only to find that his ancestral name is hated by all who live there. Wolf, believing that his father's work was unjustly maligned by superstitious yokels, tries to convince the people that his intentions are good, but to no avail.At the family estate he is visited by the local chief of police (Lionel Atwill), who warns him to lay low, since the locals are convinced that no good can come from another scientist named Frankenstein carrying out more weird experiments during raging thunderstorms. Comments: It's our good fortune to have another top-notch double feature this week, starting off with 1939's Son of Frankenstein. This was the last film Basil Rathbone worked on before starring in The Hound of the Baskervilles (1939), which vaulted him permanently onto the Hollywood A-list. Up until this point Rathbone had been a splendid supporting player, cast most effectively in villainous roles (Tybalt in the 1936 production of Romeo and Juliet, and Sir Guy of Gisbourne in Michael Curtiz's The Adventures of Robin Hood), but he also excelled as fellows who were at least partially sympathetic -- Major Brand in The Dawn Patrol, and the French pirate Levasseur in Captain Blood. But Rathbone was not seen as leading man material. In spite of his Shakespearean pedigree and obvious strengths as an actor he didn't project the same warmth as his contemporaries Errol Flynn and David Niven. This would not matter when he donned the deerstalker cap and became for decades the embodiment of Sherlock Holmes in the public imagination. Holmes was always a difficult character to cast, or perhaps more accurately an easy character to miscast (Roger Moore, Frank Langella and Matt Frewer being only three of many actors to make idiots of themselves in the role). What makes Holmes such difficult territory is that he isn't a conventional hero and is strangely immune to screen adaptations that try to make him one. Over the years many filmmakers have tried to domesticate him: prettying him up, giving him a love life, making him warm and accessible. Those adaptations invariably fail. The only successful Holmes adaptations have kept him as both more -- and less -- than human*. This is a big reason why Rathbone was so successful with the role. He couldn't do warm or romantic the way Niven and Flynn could, but those actors could not match the icy determination, the cerebral coolness, that Rathbone projected. For the same reason he is perfect as Wolf. Frankenstein père was depicted as little more than a simpering neurotic, who loses all agency once the monster is created. We are happy to discover that Wolf is made of sterner stuff. Even when events spiral out of control he manages to keep his head, and he regains the upper hand in the end. And unlike his father or the sinister Pretorious, Wolf's intentions remain good. He is motivated primarily by his desire to erase the graffito found on Henry's casket: Maker of Monsters. And he wants to erase that sobriquet not just from the casket, but from the hearts of the people of Frankenstein, and from his own guilty conscience. His circumstances are outsized, but Henry's impulse -- to redeem the reputation of his father -- is almost Shakespearean in its ambition and in its ubiquity. Wolf's also motivated by a surprisingly honest desire to expand the frontiers of knowledge. In reviewing the notes in the laboratory he realizes that his father did not fully understand the implications of the lightning that he was using to give life to the creature. In fact, Wolf concludes, it was cosmic rays, not lightning, that gives the monster its titanic strength and near invulnerability. At this point the monster ceases to be "just" an undead creature stitched together from corpses and reanimated with electricity. "He cannot die," says Ygor. "He lives for always". Accidental exposure to cosmic rays must have seemed a fairly novel explanation in 1939, but audiences would soon get used to it : by the 1950s radiation would be a one-stop shop for Universal's screenwriters. It could cause any problem and become every solution. This is movie that wears quite well on repeated viewing. Bela Lugosi is simply delightful in this movie, and made me with Ygor had turned up in a few more of these pictures. Synopsis: A stranger walks along a country road into the small English village of Iping. The man wears a coat and hat to protect himself from the late winter snow, but he also wears tinted goggles and his head is wrapped in bandages.He enters an inn and rents a room. There he works feverishly on some sort of medical experiment. Meanwhile, Dr. Cranley (William Travers) , his daughter Flora (Gloria Stuart) and his assistant Kemp (William Harrigan) are trying to understand what has become of Dr. Cranley's underling, Jack Griffin. Griffin had been experimenting on his own with a dangerous chemical called monocaine, a substance which, when injected into animals, bleaches them white -- and drives them mad. Back at the inn, a crazed and paranoid Griffin causes havoc whenever he is disturbed, and he is soon ordered to vacate the premises. Comments: Our second feature is another mad scientist picture, perhaps the best ever put to film. 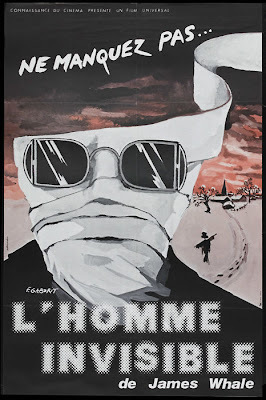 James Whale directed The Invisible Man two years after Frankenstein and two years before its sequel Bride of Frankenstein. The director's wry sense of humor is more in evidence here than it was in Frankenstein, particularly in Una O'Connor's periodic spasms of over-the-top shrieks and a wonderful scene where a disembodied pair of trousers skips merrily along a country lane. But a good deal of credit for the film's success should go to Claude Rains, who successfully conveys the full range of Griffin's madness to the audience. Rains is often criticized for an over-ripe performance in this picture (with some justification) but when you consider how much of the movie relies solely on his voice, it's easier to understand why he makes the choices he does. One of the best scenes in the film is when Griffin meets with Flora (played by the dreadful Gloria Stuart), and inside of a minute he caroms between affection, regret, contempt and outright megalomania. It's the sort of thing an actor can easily botch, but Rains sells it, allowing us to pity Griffin even as we despise the creature he has turned into. Like the H.G. Wells novella it's based upon, The Invisible Man has a somewhat unusual structure in that the closest thing we have to a protagonist is Griffin himself. Since he's also the antagonist, Rains has to make us root for him and against him at the same time. That's a very difficult job, but he pulls it off -- as the clip below will demonstrate. Skip ahead to the 5:00 minute mark and try to imagine another actor in the role. Even covered head to toe Rains commands your attention. It's one of the best film performances of the 1930s. *To any list of successful adaptations I'd include Guy Ritchie's 2009 Sherlock Holmes starring Robert Downey, Jr. While the screenplay takes considerable liberties with its source material, the essentials of Holmes' character remain: he is a brilliant detective but something of a washout as a human being, and it isn't hard to figure out why he has exactly one friend. A double feature that my father and I would have drooled over back in the 70s. With Karloff and Lugosi getting the lion's share of attention from us monster loving tots, your analysis focuses on top billed Basil Rathbone, and his infrequent starring career. We saw him as Philo Vance in 1930's THE BISHOP MURDER CASE, then admired his villainy in 1935's KIND LADY, where he was billed second after leading lady Aline McMahon. It's a shame that in later years, he came to resent SON OF FRANKENSTEIN, in the same way that Claude Rains resented the title THE WOLF MAN on his glorious resume, although he truly appreciated the role itself. 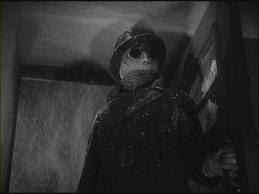 THE INVISIBLE MAN remains one of my father's all time favorites, with fine cameos from Walter Brennan (whose bicycle was stolen), Dwight Frye (as a reporter), and John Carradine, debuting in a Universal horror film, playing a Cockney informant who suggests ink be sprayed on the invisible one. He later said that the studio believed him to be British, which might also explain his more easily recognizable presence in Whale's BRIDE OF FRANKENSTEIN. Carradine had actually worked at Universal in only his third feature, 1931's HEAVEN ON EARTH, after which he turned down the opportunity to test for The Monster in FRANKENSTEIN (presumably, during Lugosi's wrangling and prior to James Whale's involvement). 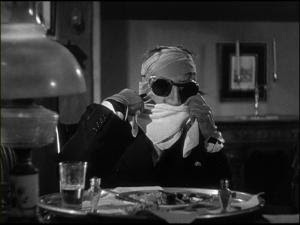 I take Carradine's pronouncements about his early career with a grain of salt, but he was at least amusing in his walk-on role in THE INVISIBLE MAN. The same can't be said of poor Dwight Frye, who had not only had a bit part but a rather dull one (however, I don't know if the radio announcer was Frye, but it sounds like him). Just in the interest of full disclosure: the night I posted this entry, I dreamed that Matt Frewer called me up and berated me for mocking his sterling performance as Sherlock Holmes. He was quite upset about it. Thanks for reading the blog, Matt! Roger Moore and Frank Langella have yet to be heard from.